« Hurray For Sebastopol, CA! The news arrived on Friday, May 9, 2013, for the first time since measurements began in 1958, the NOAA (National Oceanic and Atmospheric Administration) and a separate team of scientists at Scripps Institution of Oceanography later also confirmed that the carbon dioxide concentration in the atmosphere hit the symbolic milestone of 400 parts per million, up from about 280 (the level it was at for thousands of years prior to Industrial Revolution). The last time the concentration of Earth’s main greenhouse gas reached this mark, horses and camels lived in the high Arctic. Seas were at least 30 feet higher—at a level that today would inundate major cities around the world. The planet was about 2 to 3 degrees Celsius (3.6 to 5.4 degrees Fahrenheit) warmer. But the Earth then was in the final stage of a prolonged greenhouse epoch, and CO2 concentrations were on their way down. 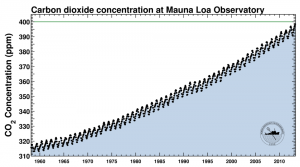 This time, 400 ppm is a milepost on a far more rapid uphill climb toward an uncertain climate future. I hope this post (with the video) will have motivated you to take part in assisting with our transition toward the renewable energy age. Join us by signing the petition for Solar-FIT For Sunshine State and start a petition for Solar-FIT for your state/country if you are not a resident of Florida (and do not reside in a place where Solar-FIT is already implemented)….for solar and/or renewable energy will ultimately be the solution in bringing down our atmospheric CO2, providing cleaner, healthier environment, and freeing us from the finite world of fossil fuel and proclivity toward international conflicts. This entry was posted on Monday, May 13th, 2013 at 6:35 AM	and is filed under Events. You can follow any responses to this entry through the RSS 2.0 feed. You can leave a response, or trackback from your own site. Just want to say your article is as astonishing. The clearness to your submit is simply nice and i can suppose you are a professional on this subject. Well together with your permission let me to grasp your feed to keep updated with forthcoming post. Thanks 1,000,000 and please continue the gratifying work.